Cotton gloves? White or blue jeans gloves? Why do registrars use white gloves? Well, so you can see when they are dirty! 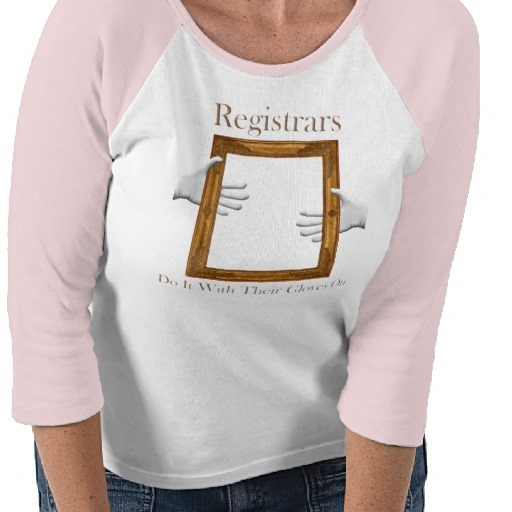 “Registrars do it with gloves on”, this is almost a slogan. All collection objects pass through the hands of the registrar and his / her team of assistants, from the very day of accessioning until they leave for exhibition or lent. And a good registrar never allows anyone to touch the objects without very clean white gloves or gloves with nonslip rubber bullets, also very clean, if the objects are heavy or slippery. UPDATE 2013/01/15: Forget about the rubber bullets. As you can see in the comments section that’s not best practice. Use of nitrile gloves – or nylon gloves with nitrile palms for the heavy artifacts – is much better. They are white cotton gloves, they are not blue jeans! All of us know we can wear a blue jeans several days (Oh, c’mon, who doesn’t? ), you won’t see much dirt… (as they are dark blue). But the white gloves used to handle objects are white for exactly that reason: to see when they are dirty and so one can exchange them immediately for clean ones and don’t handle the next object with dirty gloves. Imagine to handle objects in the collection with dark gloves “one doesn’t see the dirt on” and the damage and stains that occur to the objects handled. We can say that if there is a symbol for museums registrars worldwide it’s a pair of white gloves! This holds especially true to registrars who handle art, documents or archaeological artifacts. It is not just a smart advertising idea of the company that sell those shirts. The Mid-Atlantic Association of Museums in the USA have a project called the “White Gloves Gang”, where registrars, collection managers, arcivists, museum studies students… help one day voluntarily in a chosen museum with a collections project. I am so happy to see that this website has multi-lingual translations. I’ve been working on my Spanish and this is the perfect way to learn art terms in another language. Thanks & !Muchas Gracias! Estoy muy feliz de ver que este sitio web tiene traducciones multilingües. He estado trabajando en mi español y esta es una perfecta manera de aprender términos de arte en otro idioma. ¡Muchas Gracias! Ich bin so froh, dass diese Seite in mehrere Sprachen übersetzt wird. Ich arbeite an meinem Spanisch und das ist die perfekte Art, Kunstbegriffe in einer anderen Sprache zu lernen. Danke! ¡Muchas Gracias! Bienvenido a nuestro blog multilingüe. Esta será una buena oportunidad para que ejercites tu español, dentro del ámbito profesional que nos une. ¡Otra barrera que se cae! Welcome to our blog multilingual. This will be a good opportunity to exercise your Spanish, within the professional field that unites us.Another barrier falls! Willkommen auf unserem mehrsprachigen Blog. Dies hier wird eine gute Möglichkeit sein, Ihr Spanisch auf dem Arbeitsgebiet zu üben, das uns alle verbindet. Eine weitere Mauer fällt! For the Art terms in the Registrars work field the book: Couriers Speak, from Cordelia Rose is very good to use. This book contains all needed terms and sentences around the loan process of art objects. It’s a phrase book for couriers of museum objects. Languages are: English, German, Spanish, Russian, Japanese. Ouch, ouch, ouch. Those bullets (as you call them) are poly vinyl chloride! They are not inert! And can leave marks on everything – best only used for glass or glazed ceramics. Nitrile gloves are the best – inert, non slipping and they show the dirt (even if they are blue or purple). Be sure to get them without powder though…. For heavier duty use – you buy obtain nylon gloves with nitrile palms. Happy handling! UPDATE. Ay, ay, ay. ¡Esos nódulos (como ustedes los llaman) son de policloruro de vinilo! ¡No son inertes! Y pueden dejar marcas en todas las cosas -mejor es usarlos solamente para vidrios o cerámicas cristalizadas. Los guantes de nitrilo son lo mejor de los inertes, no deslizan y se les ve el sucio (incluso si son azules o púrpura). Asegúrense de mantenerlos libres de polvo… Para trabajos más pesados – pueden conseguir los guantes de nylon con las palmas de nitrilo. ¡Feliz manipulación! Aua, aua, aua. Diese Noppen (wie Sie sie nennen) sind aus Polyvinylchlorid! Sie sind nicht inaktiv! Und können auf allem Spuren hinterlassen – am besten nur für Glas oder glasierte Keramik verwenden. Nitrilhandschuhe sind die besten – inaktiv, rutschfest und man sieht, wenn sie schmutzig sind (auch wenn sie blau oder violett sind). Passen Sie aber auf, dass Sie die ungepuderte Variante nehmen… für den Umgang mit schweren Objekten nehmen Sie am besten Nylonhandschuhe mit Nitrileinlage. Happy handling! Hi Suzanne, thanks for the info (I didn’t even know those nodules are PVC!). We will include the information on nitrile gloves in the story as you and Sharon pointed out. Bonus question: Are there nitril gloves that don’t make the hands sweat? UPDATE. Hola Suzanne, gracias por la información (¡Yo ni siquiera sabía que esos nódulos eran de PVC!). Incluiremos la información sobre los guantes de nitrilo en el relato, tal como tú y Sharon lo señalaron. Pregunta gratis: ¿Hay guantes de nitrilo que no hagan sudar las manos? Bonus answer – yes there are nitrile gloves that don’t make your hands sweat! They are nylon gloves with the palms and fingers dipped in Nitrile They are a bit more clumsy, but they are also more durable and even, yes, washable! Respuesta adicional -Sí, hay guantes de nitrilo que no hacen sudar a las manos. Son guantes de nylon con las palmas y dedos punteados en nitrilo. Son un poco más toscos, pero son igualmente ¡más durables e incluso lavables! Bonusantwort – ja, es gibt Nitrilhandschuhe, in denen man keine schwitzigen Hände bekommt! Das sind Nylonhandschuhe, deren Handflächen und Finger in Nitril getunkt wurden. Sie sind etwas klobiger aber sie sind auch beständiger und sogar, jawohl, waschbar! Many thanks for your updated informations. It worth comment and reply that I can make, because my story of the white gloves is updated now. Since twenty years ago to nowadays those white gloves have evolved much. Muchas gracias por tus actualizadas informaciones. Vale la pena comentarlas y darte una respuesta, porque mi relato de los guantes blancos está actualizado ahora. Desde hace veinte años hasta ahora esos guantes blancos han evolucionado mucho. We no longer use the white gloves with the nodules – either plain white gloves or nitrile gloves if you need a solid grip. I believe the bumps can be considered to be too abraisive. Nosotros no usamos más los guantes blancos con nódulos -ya sean blancos lisos o guantes de nitrilo si se necesita una firme sujeción. Creo que esas protuberancias también pueden ser consideradas como abrasivas. Your comment is welcome, Sharon. This helps us to keep updated with this important and “white” resource. Thank you! Tu comentario es bienvenido, Sharon. Eso nos ayuda a mantenernos actualizados con nuestros importantes y “blancos” recursos. ¡Muchas gracias! Danke für den Hinweis, Sharon. Das hilft uns, in Hinblick auf diese “weiße” Ressource auf dem Laufenden zu bleiben. Danke! Wir verwenden die weißen Handschuhe mit den Noppen nicht mehr – entweder glatte weiße Handschuhe oder Handschuhe aus Nitril wenn es darum geht, guten Halt zu haben. Ich glaube, die Noppen könnten eventuell Material abtragen. ¡Ay! ¡Eso debió haber dolido!